Bachelor of Physiotherapy – The University of Queensland. 2009. Graduating from the University of Queensland in 2009, Kirsty has worked in Private Practices on the Sunshine Coast and in Melbourne, before moving to Sydney in October 2014. 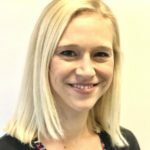 She has gained valuable experience in all areas of private practice physiotherapy including Musculoskeletal, Sports, Post-operative rehab, balance and Pilates. Having played soccer and futsal at a representative level and now with a husband who works in sport, Kirsty has a thorough understanding of the motivations for those involved in sports, whether elite athletes or “weekend warriors”. Kirsty strives to improve her patient’s quality of life by returning them to their beloved sport or activities. She aims to give her patients a better understanding of their body and instruct them on self management strategies. She has a keen interest in lower limb injuries as well as neck and back pain. When Kirsty is not at work, she enjoys good food and coffee as well as travel. Kirsty works Monday to Friday at Burns Bay Physiotherapy. If you would like Kirsty to look after you, why not give Burns Bay Physiotherapy a call. How much load can my back take?